and this operation can be easily implemented in MATLAB as shown below. 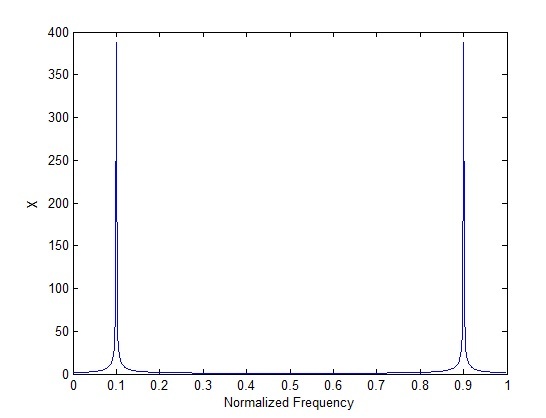 The DFT of the cosine function with frequency of 100Hz is shown below. It must be noted that the frequency in the figure below is normalized by the sampling frequency. So the peaks in the graph occur at 0.1*1000=100Hz and 0.9*1000=900Hz (image frequency). Actually if you zoom in you will see that the peaks are not exactly at 0.1 and 0.9 but are slightly offset as the frequency bins are not located at exactly those frequencies. In case of multiple sinusoids the resolution of the DFT becomes important. Higher the sample size (duration of the time domain signal) higher is the resolution of the DFT. As stated earlier the DFT is a computationally complex operation and usually the Fast Fourier Transform (FFT) is used to compute the frequency domain behavior. We will discuss this in the following posts. A simple way to expedite the process of DFT calculation is to use matrix manipulation instead of a “for loop”.This is shown below. Although matrix manipulation makes for a nice and clean code, it was found that there was no improvement in the computation time. Both the “for loop” code and the “matrix multiplication” code took about 0.35 seconds to execute. However, increasing the sample size from 128 to 1024 results in significant better computation time for the latter scheme.